A good cupcake recipe and tasty icing will help you make the best tasting cupcake at your birthday party. Even though you might get compliments on your delicious cupcakes, what makes your birthday party memorable is the presentation. Here are some instructions on how to make your own birthday party cupcake toppers. Cut out two circles from a craft paper. One circle should be a little smaller than the other one. Glue the smaller circle in the middle of the other one with a craft glue stick. 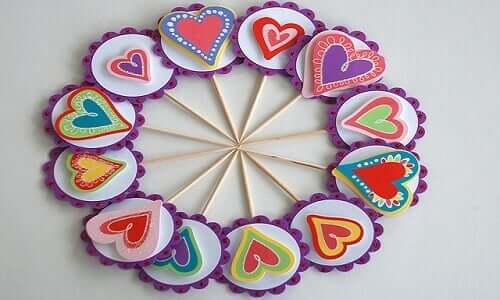 Now paste the lollipop stick on back of the bigger circle. Paste a bead in center of the circle and make the border with some more beads. You can create a 3D effect on some of your cupcake toppers. Draw some letters or cartoons on a drawing paper using a pencil and sketch pens. Paste these drawings or cut-out glitter alphabets on foam squares. Paste the foam squares on circles and your 3D cupcake toppers are ready. Make a bow shape with a pretty ribbon and tie it right below the circle. Use craft glue to keep this bow in place. Your homemade cupcake toppers are now ready. Serve your delicious cupcakes in style on a cupcake display stand and gear up to make this birthday special!